WHAT'S SO BAD ABOUT DRIVEWAY CAR WASHING? At one time, the burning of trash in backyard incinerators and open areas was a common sight in suburban neighborhoods, until concern for the environment ended this form of pollution. Today, Salem residents recycle nearly 40% of their refuse, keeping it out of landfills and reducing pollution. 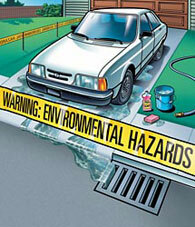 Home car washing is another serious kind of pollution that can easily be eliminated.